"A dog named J.J. Tully has a chicken named Millicent come to his dog house and ask for help finding her baby chickens. J.J. was a rescue dog so he knew how to find people and she figured he could find chickens too. J.J. agrees to help in exchange for a cheeseburger. But he wasn't very happy about having to help chickens. "I liked that it was a mystery. It was hard to figure out. It was kind of written like a Kane Chronicles book because it was written from two points of view: JJ's and Vince's. Vince is another dog who lives in the house. He has a gigantic funnel on his head because of chronic ear infections." It was a hot, sunny day when I met that crazy chicken. So hot that sometimes I think the whole thing may have been a mirage. But mirages don't have chicken breath, mister. As C mentioned, Vince does also narrate a bit of the story, but not much. Most of it reminded me of one of those old TV shows with the private investigators who had the voice-over narration about what was happening. I thought it was cute, but can't see how a kid would "get" this style, and I don't think C really did even though he liked the book overall. The story itself was decent, and the mystery held my interest. I just didn't think it was a great book. C, however, rated the book 4/5, while I rated it 3/5. 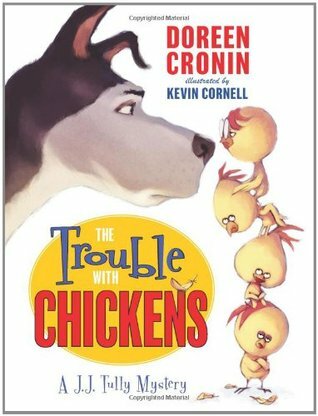 This review was written based on a copy of The Trouble of Chickens that I won a couple years ago in a giveaway.